When Germany invaded Poland on 1st September 1939 the Polish army put up a stout resistance and had many local successes. However the lack of many heavy weapons and modern equipment meant the odds were stacked well in Germany's favour, and despite the bravery of her soldiers Poland succumbed to the German and Soviet armies in little more than a month. Fortunately many men escaped and made a significant contribution to the continued fight on many fronts, but this was achieved mostly with the uniform and equipment of their host country, mainly Britain and the Soviet Union. The figures in this set wear the Polish national uniform as it was in 1939, and are therefore only appropriate for the campaign of that year. The uniform was quite modern and based partly on that of Germany, and has been reasonably done here. As with most World War II infantry sets this one has a number of weapons apart from rifles. The fourth figure on the second row is stooping to use a wz.36 46 mm mortar, which is a fair model but the tripod is very thin and a solid triangle of plastic. The first figures on the bottom row are manning a 7.92 mm wz.30 heavy machine gun, which was a copy of the Browning M1917A1. This is a somewhat simplified model (most obviously the cooling system is missing) but fairly accurate, although it sits on a tripod that is almost flat on the ground. Beside this is a man firing a wz.28 light machine gun, and beside him is another firing a wz.35 anti-tank rifle, both of which are greatly simplified and have their tripod filled in for no apparent reason. However all these weapons were in common use in 1939 and are well chosen. 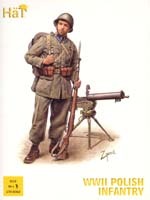 The choice of poses is reasonable for a World War II infantry set, but these are far from attractive figures. The sculpting is decidedly poor with some very awkward features such as the rifle of the NCO (second figure, second row) being embedded in his arm. Some of the helmets are a very peculiar shape (the marching man appears to wear a bonnet rather than a helmet) and detail areas such as hands are no more than blobs with crude lines scratched out to suggest fingers. In some areas the sculptor has clearly not tried - on most figures the ankle puttees are just a line scored round the lower part of the trouser, and both bayonets and entrenching tools are much too short. However the most obvious feature when looking at these figures (which is not apparent from our pictures) is how very flat they are - the man with the mortar all but disappears from the side. The figures are made in a soft plastic that takes polystyrene glue well (only necessary for putting together the heavy machine gun), but the many places attaching them to the sprue are difficult to trim as the material tends to tear rather than cut if not handled carefully. By producing a large box HaT have included a good number of poses, and we were pleased to see the range of weapons that were included without impacting on the number of riflemen. The main box art is absolutely stunningly good, and the drawings on the back are also excellent. It is just a shame that the figures themselves fail to live up to the expectations generated by the box.